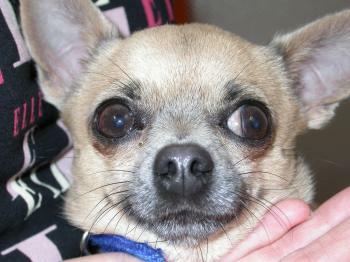 This two year old chihuahua presents with a somewhat protruding left eye with lateral strabismus. With a forced duction test it is possible to move the globe normally and there is no pain on opening the mouth. What is your diagnosis likely to be and what would you do to confirm it? Well this is an orbital space-occupying lesion and given the lack of pain on mouth opening its likely to be a tumour. I broke this news to the owner who then surprised me by asking why the same had occured in the right eye but completely resolved! 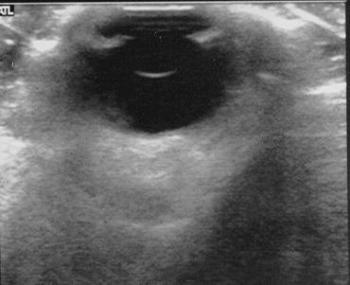 Here is an orbital ultrasound which, because of its heterogenous echogenicity looks more like inflammation than neoplasm. If we were being strictly scientific we should have done an ultrasound-guided biopsy but understandably (given the dog is not at all bothered by the problem at present)we’ve chosen to treat with systemic NSAIDs and see what happens! This entry was posted in Cases and tagged dog, exophthalmos, strabismus. Bookmark the permalink.